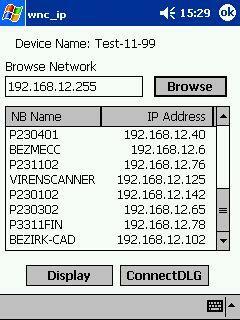 At the first Time You Start, WNC_IP creates a Folder named “Network” in the Root Filesystem of your Pocket PC. After this You must warm reset your PPC. In this Folder makes your PPC the connections with the Remote Shares, Windows CE does not Support Drive Letters. Next time You can see all your Windows IP Hosts that have some Folders ore Disks to Share, with the Host Name and IP Address. To get connected to a listed Share simply doubleclick there corresponding Entry. Then start your Favorite File Explorer and Browse into the “Network” Folder to work with your Remote connection. With the “Display” Dialog Button You can Manage your Remote connections. At “ConnectDLG” Button You get a Dialog to configure a individual connection to a Remote Share.